An insanely simple and super flavorful dinner – ginger scallion pork lettuce wraps require only 15 minutes and 8 ingredients, making them perfect for a weeknight but they taste like the weekend! This recipe first appeared on Instagram in partnership with The New Food Collective. Welcome back to TACO MONTH on Hungry by Nature! As I mentioned last week, I am going to be sharing recipes all month long to get you ready for Cinco de Mayo – because nothing is better than holidays dedicated to margaritas, tacos, chips and guac, tortillas, and queso. Last week we kicked off Taco Month with a favorite appetizer of mine; and today were moving on to the main course. 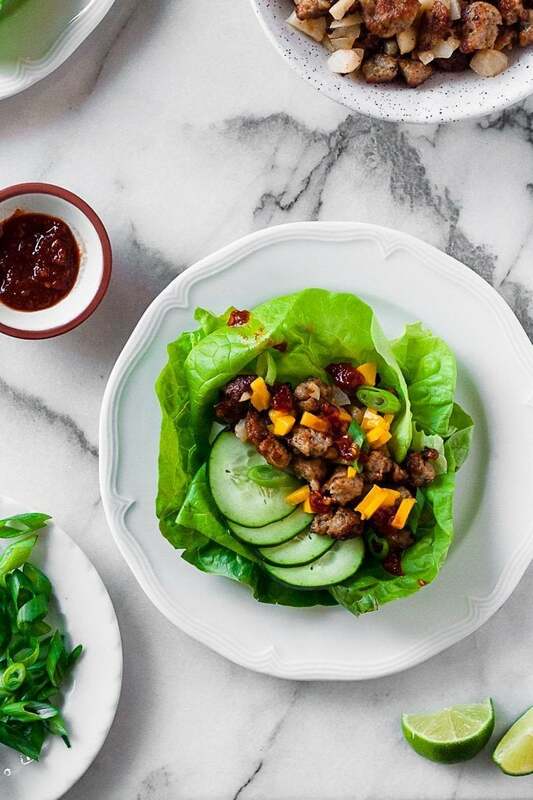 You only need a handful of ingredients for these ginger scallion pork lettuce wraps! 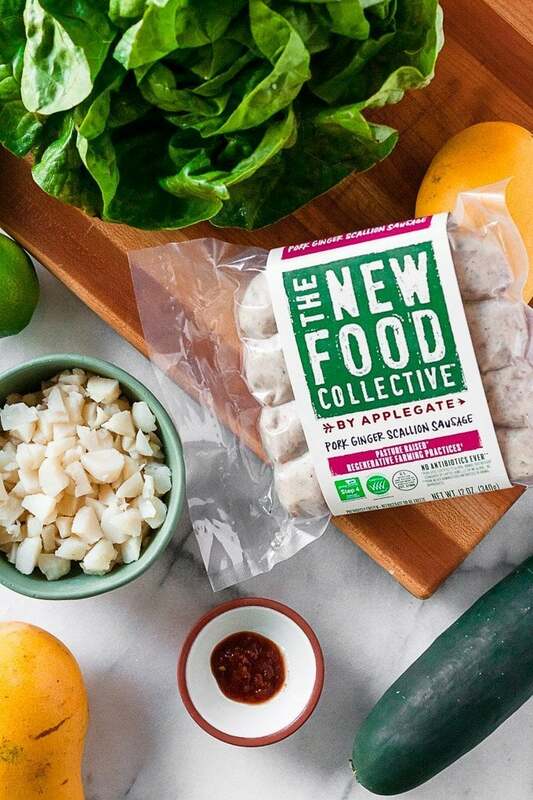 Ginger Scallion Pork Sausages: I picked up these new Applegate sausages at my local Whole Foods (currently The New Food Collective is available in select Chicagoland stores) and absolutely fell in love with them! 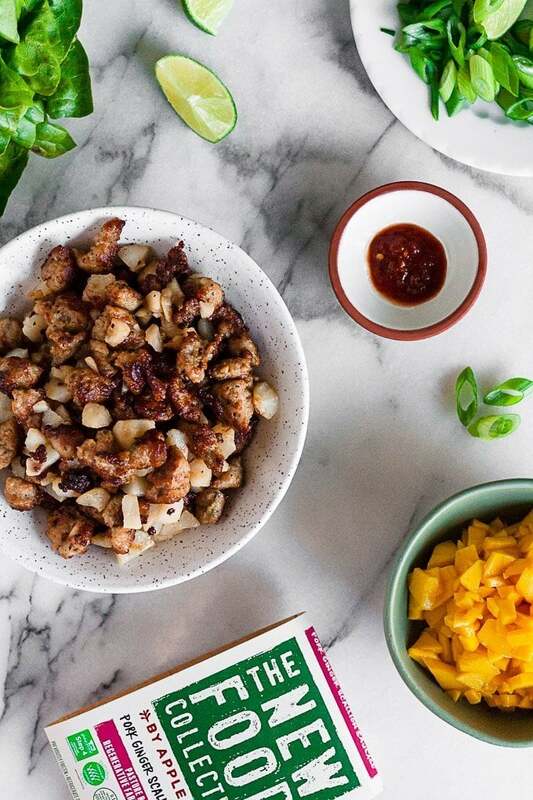 The ingredients are great (PORK, WATER, GINGER, SCALLIONS, CONTAINS LESS THAN 2% OF THE FOLLOWING: SEA SALT, BROWN SUGAR, VINEGAR, BLACK PEPPER, MUSTARD SEED. ); and they would be easy to replicate if you are not local. Water Chestnuts: Water chestnuts add the perfect crunch – because texture is key – and are super refreshing, which you need because of the spice! 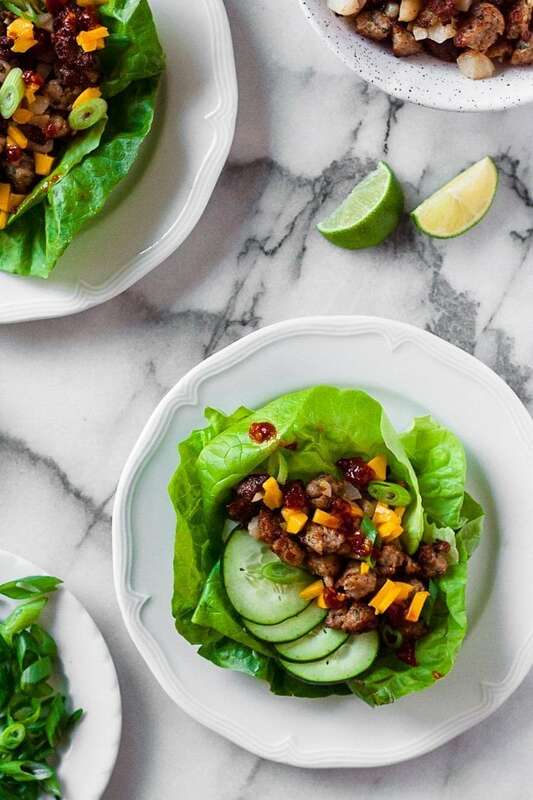 Boston Bibb or Butter Lettuce: Is there any other lettuce that can be used as a lettuce wrap?! No. I mean, of course there is, but nothing beats butter lettuce; it’s super thin, pliable, and serves as the perfect wrap. Cucumber: Like water chestnuts, the cucumber adds a fresh, crisp element to these wraps. And a cooling factor too; thai chili sauce is spicy! Mango: Diced mangoes are key to bring all of the flavors together. You need the sweetness of the mango to offset the savory sausage and spice. Lime Wedges: Because all tacos are better when squeezed with fresh lime. Thai Chili Sauce: The Thai chili sauce is what really kicks up the heat of these wraps! Just a few drops and you will be feeling it. If the ingredients of the ginger scallion pork lettuce wraps weren’t enticing enough, I know you are going to love how easily they come together! All you have to do is remove the sausage from the casing and brown in a skillet. As the meat is browning, dice your water chestnuts, slice up the cucumber, chop the mango, and wash the lettuce. When cooked through, the water chestnuts are added to the pork and served in the lettuce wraps. Then you can go crazy with toppings! And that’s seriously it. So easy! And it’s perfect for a weeknight dinner. If you are local to Chicago, I highly recommend you stopping by Whole Foods to check out The New Food Collective. I know you are going to LOVE these ginger scallion pork lettuce wraps!! When you make them during taco month, post a picture on social media and use the hashtag #imhungrybynature so that I can see!